Happy last-saturday-of-summer-vacation fine people!!!! If you find yourself a bit depressed about being back at work next week while on your way in, just remember one thing: Your job is the best and most important in the world!! As you know, each week (or maybe once a decade) I give a shout-out to what I think is the craziest, zaniest thing to occur to the education world in NYC and beyond. Sure, It's education and the whole chaotic, rage infested discussion is pretty crazy. But only a few of these insanely silly stories can rise to the level of actually being 'nuts. -But only a tiny amount actually earn the coveted title of DOE-nut Of the Week. For the sake of all that is noble and sane in this world, that award winning DOE-nut is must get a shout-out, don't you think? For this week's DOE-nut Of the Week, I'd like to play a little game. You see, the actual award goes to the New York State Education Department (as you may have heard, they released the teacher rating data on Thursday -from previous year!!! The actual data (which does not include NYC, as it didn't have APPR in 2012-2013) can be found here), but I'm not sending any prizes up to Albany. No no no. 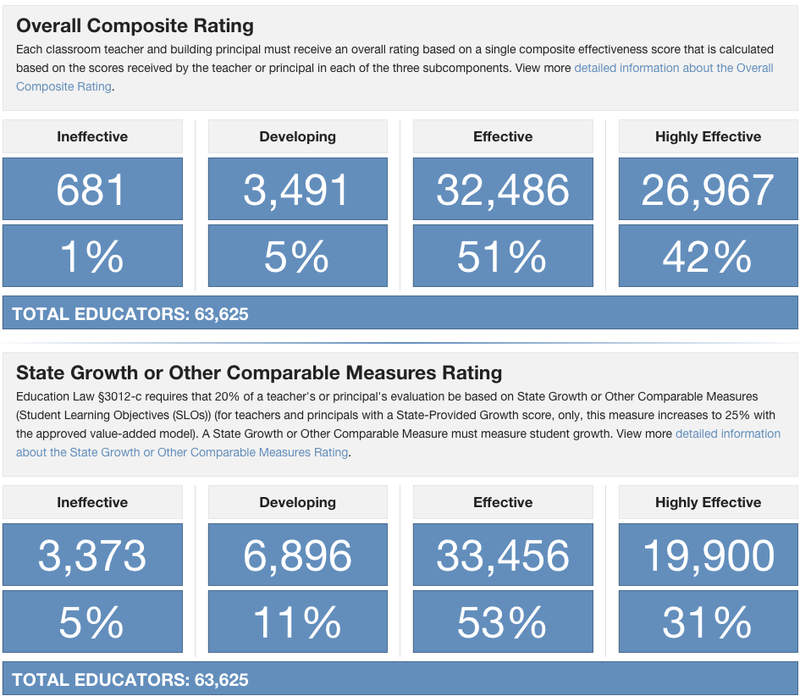 The actual prize (which is a gift card to Dunkin' Donuts via email) will go to the first five people who can examine the image below and tell me, in detail, what is so crazy, zany and insanely silly about state complied final teacher ratings. If you need a hint, I'm very sorry, but you're not gonna get it. I, however, will say this: When the notion of using data to make decisions (and Big Data is used all over our society to make all sorts of decisions) and that data is operated by oodles and oodles of politicians who each have their own agenda, then you are bound to get some data that gets used and confused. That's what you're looking at below. It's data! But it's profoundly confusing data -data that no longer serves a purpose worth serving any students. Check it out and see if you can guess. The first person to drop a comment with the correct answer will indeed get a $5 gift card to D&D on me. As you know, each week (or maybe once every year) I give a shout-out to what I think is the craziest, zaniest thing to occur to the education world in NYC and beyond. Sure, It's education and the whole polarized, anger infested conversation is sort of crazy. But only a few of these crazy stories can rise to the level of actually being 'nuts. But only a tiny amount actually earn the coveted title of DOE-nut Of the Week. After reading this post, I hope you'll see why. Let's begin!! The 'Big Edu News' this past week was the release of education polls (yes, they actually poll the public about public education. Can you believe that?). Two polls, to be precise, about education were released earlier in the week. Among other things, the polls -PDK Gallop Poll and the Education Next Poll-asked people how they felt about those little known standards called the Common Core (whereas by 'little known', I mean to be sarcastic and by 'Common Core' I mean, well, the Common Core). 'Ha ha ha' went the rest of the blogosphere. These polls echoed the sentiments from a Sienna College Poll released last July which also showed that the Common Core wasn't very popular among Americans (check that out here). Yet beneath the headlines was some pretty important information that was rather underreported (and by 'underreported', I mean pretty well ignored). You see, our education system has never (ever) done an acceptable job of providing equal opportunity for America's Black, Native and Latino communities (disclaimer: The statement I just made extends to the system. NOT to the great individuals or even groups who have operated within that system It is only a statement directed toward the system). So if something as far reaching as the Common Core is going to be tested for popularity, then the popularity of them among these members of our national community are important (really really important. ICYMI, part of the reason for the implementation of the CC (and for the new evaluation systems across the US and for expansion of charter schools) was because the political establishment got sick and tired of our fellow American members of these communities being left behind in the first place. That's another thing that's underreported, yet I digress). 69% of Black Americans polled and 62% of folks who described themselves as 'Hispanic' actually support the Common Core.... This matches a Sienna College Poll last July Showing that 60% of 'African-American/Blacks' and 49% of 'Latinos' felt the CC should "continue to be implemented". This, to me represents a fairly strong popularity for the core among the parents of the students I teach. 69 and 62 percent!?!?!?!? Wow!! In fact, that poll was only the Education Next Poll. The PDK/Gallup didn't even measure along racial, ethnic or even gender lines. Seems like it only cared if you were Democrat or Republican (yuk). Those numbers were strong enough to make Ed change his mind and actually come out in support of the Common Core (he had previously been opposed). Yet despite the importance of how members of these communities view the Common Core, I saw not one journalist delve into it in any of the headlines or ledes about the polls. Had the extreme popularity of the Common Core among members of these communities been treated like the Takeaway that it is, I think we would all be having a different conversation today about the results of these polls. That's a conversation, I believe, that we all need to be having. We need to sit down and talk. At the moment, we need to talk about why "The Core" is so unpopular among some Americans and so wildly popular among others. But more important than that, much more important indeed, we all need to talk about how to respond given the fact that these standards are supported by a significant group within American society yet not, the polls seem to say, by the people who teach their children. It is a disservice at least and a crime at most that we do not have that talk. But we don't. And by 'don't', I mean don't. Why don't we? Well, there are lots of reasons why. It is a very uncomfortable conversation to have. It has no clear end. It demands personal growth from a whole bunch of folks and stands to make a whole bunch more feel quite indicted. But another reason for this -certainly the reason this week- is the press. Their either misunderstanding of the true crux of a story that effects so many New Yorkers and Americans, or misunderestimating (in true George W. Bush form) of precisely how important the opinion of our fellow New Yorkers and Americans in these communities are have had the effect of letting a large portion of us off the hook from having to address it. Being let off the hook of having this difficult conversation is a privilege that only a certain amount of us Americans have (it is also a privilege I am growing weary of enjoying but there I go digressing again). Because of this misunderstanding or misunderestimating (or whatever collective stupidity caused them to ignore the fact that the standards are extremely popular among Black and Latino Americans) no one -except maybe this dude Ed -is talking about it. In the world of general discussion, it seems (to me at least) as if this most crucial of facts did not exist. Poor form, folks. Poor poor form. .....to The Fourth Estate (you wonderful collection of fine professionals who seem, like sand after we've left the beach, to be everywhere doing not much but reminding us that you're there) for either missing or willfully ignoring a definitively important part of this week's edu polls, I confer upon you this DOE-nut Of the Week for the week of August 18, 2014. Congratulations guys and gals!! The first five professional journalists or editors who missed this story and contact me will receive the prize of a $5 gift card (via email, of course) to the Dunkin Donuts of your choosing, where you can have a seat, whip out your smart phones and convince your friends and family that you're not actually hurting the world through the act of omission, that you're really helping it and that, hey, who is the doenuts guy anyway to talk smack about you ad the important work you do.